by Brianna Crandall — January 4, 2016 — The new St. Regis Astana luxury hotel in Kazakhstan has become the first hotel development in the world to be assessed and receive certification by the Loss Prevention Certification Board (LPCB) when piloted against SABRE, the new security certification scheme for buildings and built infrastructure assets by U.K.-based building sciences authority BRE Global. Today, more than ever, international travelers need to feel confident that they will be looked after when they are away with, or from, their families. This certification scheme evidences the commitment of the team to delivering a safe and secure destination for their future customers. This is a major achievement for MG Development LLP and St. Regis Hotels and Resorts. We are very proud to become the first hotel in the world to obtain SABRE certification. Safety of our guests is our paramount priority, and I am very proud that our efforts here at The St. Regis Astana have been recognized and certified by such a respected global authority. SABRE is a security certification standard that building owners and occupiers can adopt to measure and evaluate how well they manage security risks, and to communicate their security credentials to the market. The independently operated program recognizes and rewards a risk-based approach to security, good design, construction and management. Find out more about SABRE and the extensive range of security certification and testing services available from BRE Global (including LPCB) on the group’s Web site. 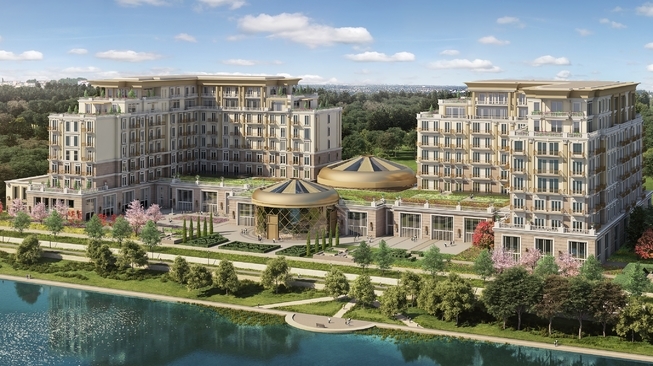 St. Regis Astana consists of the hotel, residences, and commercial space — all planned, constructed, and operated in accordance with the BRE’s Building Research Establishment Environmental Assessment Method (BREEAM), according to the Web site. The manor-like, modern interior contrasts with references to Kazakh nomadic history. The 120 expansive accommodations feature outstanding views of the river and the city, providing the utmost in comfort and décor along with cutting-edge in-room technology, such as individual climate control and complimentary wireless high-speed Internet access. Amenities abound, including a spa and business center. If your perimeter gets breached, this new security drone system will automatically check it out November 5, 2018 In "Products and Services » Security"
Does your reception area leave a negative impression? This report shows how "smart technologies" can help October 10, 2018 In "Surveys and Trends"
For up-to-date best practices in school safety and security, check out these new guidelines December 24, 2018 In "Products and Services » Publications"